You have options when it comes to how you’ll replace your missing teeth — but did you know that nothing gives you as much stability or confidence in your new smile as dental implants? It’s true. And with a success rate of up to 98 percent in eligible patients, you really can’t go wrong with this treatment option. If you’re wondering what are dental implants, and how dental implants in Creve Coeur work, you’re in luck! We’ve answered these and other important questions below. A: Dental implants are small posts made of titanium. It may help you to imagine them as tiny screws. Inserted directly into the bone through your gum, the implants act as a prosthetic root for the tooth replacement that is bonded or attached securely on top. Dental implants can be used to support a single crown, a bridge for several missing teeth, or a whole row of dentures when total tooth loss has occurred. A: So we talk a lot about how dental implants are the best replacement option available, but why is that, exactly? It’s because nothing else gives you back your missing tooth as well as its root. With the stimulation provided by this prosthetic root, your jawbone has the activity it needs to thrive, remaining healthy and whole for years to come. Q: What Does the Procedure for Dental Implants Involve? A: Once your implant dentist has determined that you are a good candidate for dental implants (see more on candidacy for dental implants below), you will be referred to a trusted oral surgeon for the placement of each implant. After the procedure, you’ll embark on a recovery period of three to eight months, during which the jawbone will gradually fuse with the titanium implant. Once this process is complete, your dental implants are fully integrated in your mouth, and the restoration of your implants can begin. You’ll come back to your dentist in Creve Coeur for the second phase of your dental implant treatment, or when your prosthetic tooth replacement — either a crown, bridge, or denture — is secured to the tops of your dental implants. After this important step, the procedure is complete… and you’re ready to flash your new, complete smile to the world! A: The only way to determine your candidacy for dental implants is to schedule an appointment with your implant dentist, Dr. Jim or Dr. Jenna Feigenbaum. Generally, patients should have plenty of jawbone structure in place for successful anchoring of their dental implants. Adequate oral and overall health are also a requirement for proper healing following the procedure for dental implants. Remaining Questions? Contact Us Today! 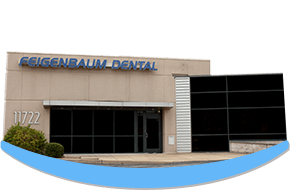 If you’d like to discuss your options in tooth replacement, including whether or not dental implants may be the best choice for you, please get in touch with Feigenbaum Dental today! Request your appointment online.